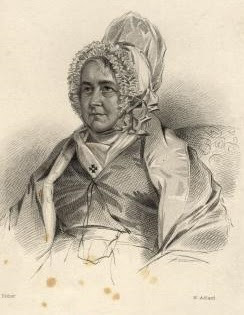 The 19th-century writer Mary Anne Schimmelpenninck (1778-1856) was the daughter of the Quaker businessman Samuel John Galton. and wife of Lambert Schimmelpenninck, a member of a noble Dutch family trading living in Bristol. She was introduced to the writings of Port-Royal through Hannah More and wrote several works popularising Jansenist piety. In 1816 she published a history of the destruction of Port-Royal, which included an account of a journey she herself made to the ruins during a tour of the Continent in 1814. BEING AN EXTRACT FROM MY JOURNAL TO THE CONTINENT OF THE 18th OF SEPTEMBER, 1814. .... Next morning we set out from our uncomfortable inn at Versailles, to make our long projected visit to the remains of Port Royal Des Champs, which is only about six miles further…. The cross road into which we turned, leads through the valley of Port Royal, and close under the walls of the monastery to Chêvreuse. The way, which is exceedingly rough and ill kept, rapidly ascends to a sort of flat or wold, such as those on the tabled hills of Somersetshire. Though by no means unsafe, we could proceed but slowly; and there being no avenue on each side, as on the high roads, its appearance was very dreary. ... At length, the tabled plain over which our road had generally extended, seemed suddenly to terminate just before us, as though we were arriving at the brow of a precipice extending across the whole plain. About a hundred yards to our right was a large old-fashioned farm-house, which the coachman informed us was LES GRANGES, the former abode of the recluses. He advised us to drive there first for directions, as the descent into the valley of Port Royal was exceedingly steep; and that he was unacquainted with the roads, one of which was very unsafe, owing to the precipitous descent. Accordingly, we turned into the cart-track which led to the house, and which was bounded by a high garden-wall, till we came to a lofty archway, which having passed through, we found ourselves in the farm-yard of the celebrated LES GRANGES, the abode of the LE MAITRES, the FONTAINES, the ARNAULDS, &c.
Here were the farmer and all his men at work, and the mistress busy feeding her poultry. In a moment our carriage was surrounded by master, mistress, men, maids, dogs, pigs, hens, and turkeys, who all seemed equally amazed at the sight of a carriage in so remote a place. They however told us, with that amenity which we found characterize the Dutch, the Flemish, and the French, that we were perfectly welcome to see the whole house; that they would then conduct us by the foot-way down the steep, to see the remains of PORT ROYAL DES CHAMPS; and that if we liked to take a farm-house dinner, they would with the greatest pleasure get us whatever their house afforded. I must now introduce you to LES GRANGES. More than half of the original building, we were told, is demolished; but what is left, has yet the appearance of a very large and old-fashioned farm-house, built of rough stone, and much like those I have seen in the neighbourhood of Shepton Mallet in Somersetshire. The entrance to.the house is from the farm-yard. A considerable part of. 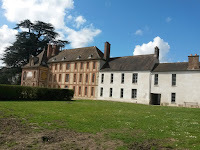 the lower floor was formerly appropriated to the refectory of the recluses, but as it is now partitioned into several rooms, I could not judge of its size. We then went up a staircase which is of brick or stone, to visit the chambers of the recluses: they are all floored with the small hexagonal tiles, which are so common in France and Flanders. …These brick-floors give the bed-rooms a most forlorn appearance; and to an English traveller, form a strange contrast with the beds, the curtains and coverlets of which were frequently of silk or satin. The physician Hamon's room was one of the first we saw. It was small, and must have been inconvenient. The furnace, oven, mortar, and various other utensils for preparing medicines for the poor, still remained. 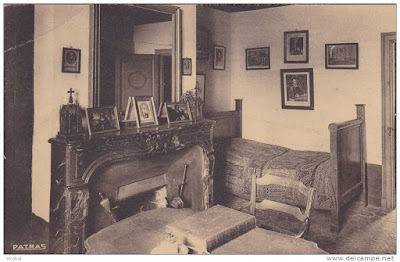 Through this room was a little light closet, in which he used to sleep on a board, instead of a mattress .The staples which held his bookcase yet remain, as well as the alarum by which he called himself to midnight prayer. 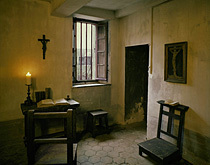 We then visited several of the other cells; after which, leaving our baggage in M. Ie Maitre's room, where we were to dine, we set out under the auspices of Madame Methouard, by the short path-way down the steep, to the Monastery; leaving our carriage, and our valet de place, Camino, to meet us near the church-yard of St. Lambert; and only taking with us our English servant, to carry a basket and knife, which had already served us at Brederode, Louvain, Cambray, and Antwerp, to procure " des reliques bien avérées." Our way lay through the farm-yard, where a door opened upon a space, which extended under the wall, along the brow of the hill. Here we distinctly perceived there had been a terrace, where the recluses walked to meditate. On the outside, the slope towards the brow of the hill was planted at intervals with fruit-trees, and was formerly their orchard. On reaching the verge of the steep descent, we, for the first time, beheld Port Royal. Imagine the hill forming a complete steep or precipice, extending in an amphitheatrical form, and shagged with forest trees, chiefly beech, horse and Spanish chesnut, lime and ash; and in the bottom, a beautiful level plain, watered by a brook, and terminated by an opposing range of wooded hills; in the midst, and almost directly under our feet, covered with a profusion of creepers and wild flowers, are the silent remains of the Monastery of PORT ROYAL DES CHAMPS. The view, without presenting any particular feature of magnificence, is yet one of the most completely beautiful it is possible to conceive. I could scarcely imagine, whilst contemplating it, that the view I was looking at was the same place which Madame de Sévigne describes as " Un désert affreux et tout propre à inspirer le désir de faire son salut." Its character, on the contrary, is singularly that of cheerfulness and elegance, though with the most perfect stilness and seclusion. Perhaps it may be, in some degree, altered from this circumstance, that formerly all the circumjacent hills were shagged with lofty forests, which, would both increase their apparent altitude and darkness of colouring; whereas now, though beautifully wooded, there is a sufficiently great proportion of coppice, to give the forest trees room to expand in a broad shade…..
…. I must observe, that the monastery itself, is so completely destroyed, that at the distance at which we stood, the ruins of its foundations, especially as they are grown over with shrubs and field-flowers, are scarcely perceptible, except as roughening the verdant plain. …..On the left, the road remains flanked with eight towers, built during the civil wars. Near them appears another grand gateway, which formerly led to the Hotel of the DUCHESSE OF LONGUEVILLE. The terrace of her garden still remains elevated above the level of the valley, commanding a view over all the gardens of the monastery. The dove-cote too yet remains, the mill also and the house of the miller, formerly the habitation of the pious PETER BOURCHIER, and the solid stone-work constructed by the recluses, to draw the waters from the meadow, and render the naturally marshy valley healthy. Beyond, is the level, uninterrupted verdant plain, that formerly was the garden of the nuns; and still farther, the beautiful brook which divides the valley. In front of the place where we stood, and just at the foot of the opposing wooded hill, is a sort of amphitheatre hollowed out; it is carpeted with turf, and formed with rude stone-work, like a grotto: it is overshadowed by the wide umbrage of the forest trees around, and above; and the remains of long stone seats, shew the place where the nuns of Port Royal used formerly to work together, and to hold their conference. This place was called the Desert; and many remaining pathways leading from it, and branching off in different directions, through the wooded side of the hill, still mark 'la solitude', where the nuns used to walk for the purposes of refreshment or meditation. All else is so completely ruined and demolished, that unless we had taken the plans and drawings, we could not possibly have distinguished the various parts of the buildings, although the foundations are to be traced with the greatest ease in every part. ………After contemplating the view for some time, we prepared to descend the hill, to take a nearer, and more detailed view of the ruins. Accordingly, we began cautiously to descend the steep, by a rude zig-zag path, or track, which is, however, so precipitous, that it is by no means easy to keep a firm footing, even by holding the boughs of the trees and shrubs through which it winds. As we were going down, Madame Methouard told me, that these woods were formerly reserved for the game of the Abbess of Port Royal…..
On reaching the bottom of the hill, we found ourselves in the private road, formerly bordered by an avenue, which turns out of the Chevreuse road, and runs between the foot of the hill and the north monastery wall to the Abbey door. This is a noble gothic gateway, of the style of the thirteenth century. On the right was a door for foot-passengers. In front is a little plain, where the poor used to assemble to receive food and alms. 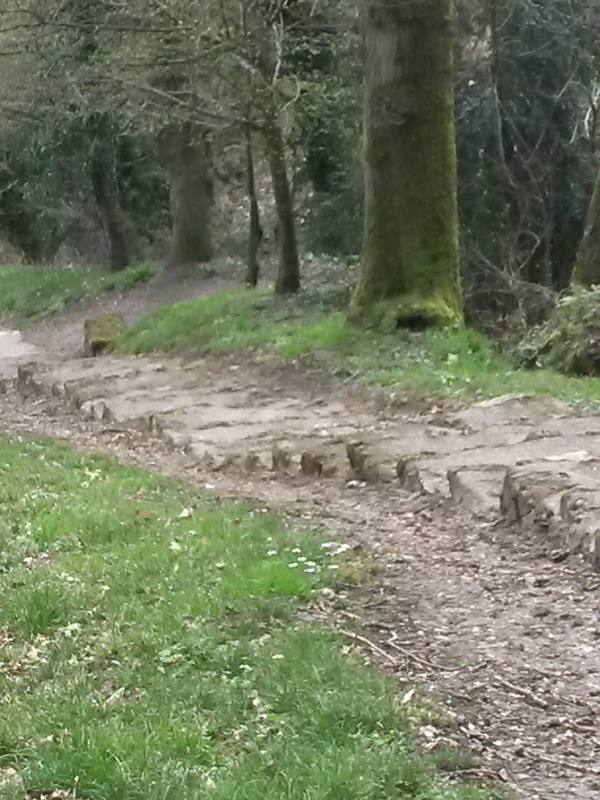 The traces of the stone benches yet remain. Of this spot Madame Horthemel's view is a very exact representation. Near this, originally, was the porter's lodge, and rooms for the servants, but of these no traces but the foundations remain. On passing under this archway, we found ourselves in what was the grand outer court of the monastery .which was formerly interspersed with trees, and was bounded in front by the church, and the saloons for the reception of guests staying at Port Royal; on the left by a wall, separating it from Madame de Longueville's hotel; and near the entrance door, and on the side next the lake, by laundries, carpenters, locksmiths glaziers, and shoe-makers' work-shops, with three; large stables, all which latter had workmen, and servants' rooms above, and extensive granaries over all. 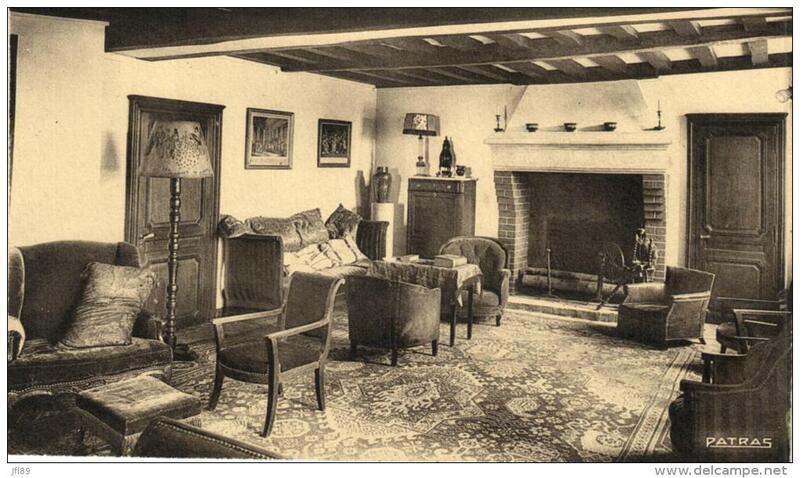 Besides which, in one corner, was a large infirmary for the servants, and the house and garden of the confessor. The whole is now one level plain of turf, scattered with occasional ruins, and regular traces of foundations; but so very little remains, that with the exception of the buildings I before mentioned, they are generally speaking, I should imagine, not above eighteen inches high, except in some few places, where they were about as high as my head, as I stood by them. Some way to the left of the entrance, extends a long range of ruined foundations, which, on consulting the description of the buildings of Port Royal, by Besogne, Clemencet, and Racine, and comparing them with Mad. Horthemel's plans and drawings, is, I find, the long range of buildings appropriated to guests, which were divided into separate houses for men and women, and which had a very pretty garden behind it, extending as far as the wall of the monastery, and a solitude, or planted seclusion for meditation on one side. Nothing of all this is now perceptible. The whole is one green meadow, the verdure of which is most beautiful, and enamelled with a thousand different field-flowers, which, as you crush them, exhale the richest perfume; and the ruins themselves are covered with a rich profusion of the most beautiful creeping plants. After crossing what was the grand entrance court, (and it is by no means an inconsiderable distance) we came to what was formerly the site of the church. Nothing of this church now remains but one vast pile of ruins extending on either side, festooned with the most beautiful and fragrant wild flowers, whose vivid tints gleam intermixed with brambles, thistles, and nettles. The goats were browzing on the shrubs which grew amidst the neglected ruins, and sheep were lying down under the low arcades which in several places just here remain entire. Although the whole is so demolished, that none of these ruins I imagine can be above six or seven feet high, yet amidst the heaps of stones and rubbish lying about them, we often traced the heads of angels, or rich pieces of Gothic fret-work, or broken columns or capitals, peeping out under the rich profusion of wild flowers which covered them, and which so completely mantle the ruins, that at some distance it would not be easy at once to distinguish them. Cattle were quietly grazing on the green expanse of what was once the church. At the farther end, where once the high altar stood, is now a spreading walnut tree, under whose wide shade we stood for some time contemplating the scene of ruin before us; like the countenance of death in the righteous, its aspect was hallowed and beaming peacefulness amidst the stillness and silence of desolation. Yet a few paces farther was the choir, where the nuns of Port Royal performed the continual service of the Holy Sacrament, and where the ecclesiastics and Abbesses of the monastery were interred. There, rising in the midst of a pile of shapeless ruins, a picturesque and aged weeping willow bends its silvery foliage over their graves. On one of the rude stones beneath, some visitor probably, has deeply but rudely scratched with a knife, .the words: "By the waters of Babylon we sat down and wept, when we remembered thee, O Zion." The yellow lichen was beginning to deface some of the letters of this inscription, and many years are probably now passed by, since the individual who wrote it, has rejoined the saints he mourns. Immediately behind the church which formed one side of the square, were the cloisters and burying ground: at present grass and bright field-flowers cover the whole expanse, yet the unevenness of the ground still records the barbarous exhumation of 1711, and the remains of the stone cross in the centre is covered with the names of pilgrims who visit the spot. Many of the bodies of the saints of Port Royal, no doubt yet remain undisturbed. At the time the new dormitory and cloisters were built, the pavements of the church and the burying ground were raised nine feet. All the bodies which were interred previously to this time, probably yet remain there. Amongst them it is supposed must be included those of the Duchesse de Luynes, and of M. de Sericourt. The church of Port Royal was not absolutely destroyed, till some time after the general demolition. Its tower subsisted till very lately. A very few years ago it fell, and some of its fragments struck the earth with such force as to discover the lid of a coffin. On opening it, appeared the body of a priest in perfect preservation, arrayed in his sacerdotal vestments. No inscription disclosed his name, but the heavenly peace that sat on his countenance, marked him as one of the worthies of Port Royal. Continuing our road strait forward, over the former garden of the monastery, which was of very considerable extent, we came to the beautiful stream which intersects it, and which formerly divided the kitchen, herb, and fruit gardens, from what was termed the solitude; which being removed beyond it, was at a sufficient distance from the monastery to form a place of retirement, where the nuns used to walk and meditate. The solitude was formerly planted thickly with forest trees, which, after extending over the remainder of the meadow, also covered the hills bounding the valley beyond. Formerly, the stream was beautifully clear, and a little bridge over it, led to the desert; but, at present, it is in some places choakcd with flags and reeds, or mantled by the most beautiful aquatic plants-; amongst the profusion of which, I particularly remarked the Parnassia Palustris. The long grass which fringes its banks, was exquisitely luxuriant and beautiful, growing to a height I never had seen before; and a number of wild water-fowl, especially moor-hens and dobchicks, were diving and sporting amongst the reeds. Not very far beyond this stream, arose the precipitous hills of the opposite boundary of the valley, covered with forest trees. Just at their foot was situated the desert I mentioned before; and at this distance, we distinctly discerned the rustic amphitheatre, partly natural, and partly rudely shaped by art, which was formed in the surrounding rocks, and thickly sheltered by trees. Here the nuns repaired in the afternoon, in summer, to work and hold their conference. 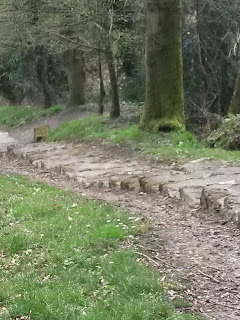 An ascent of rude stone steps formerly led to the top of this amphitheatre, which was surmounted by a stone cross, from whence paths diverged through the woods up the hill, in various directions. The nuns sat to work on stone benches below. A few vestiges of the stone seats, and of the cross, yet remain. We only saw this from the side of the stream on which we stood; but we did not go to it, as there was no bridge on which we could cross. Having gained the utmost attainable verge of the site of the monastic enclosure, we determined, as we had entered on the right side, to return by the left, that we might see as much as possible. On reaching the entrance of the Hotel Longueville, we came out through the great gate, into the Chevreuse road, where we had ordered our carriage and valet de place to meet us. 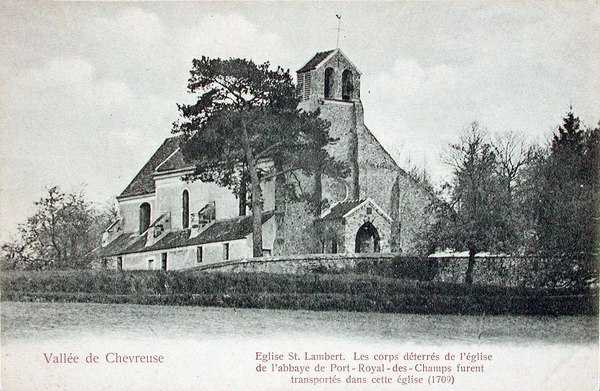 Instead, however, of ascending the hill to Les Granges, we determined to return on foot, by the outside wall of the monastery, to examine the towers built during the civil wars; and then to go on, in the carriage, to the church of St. Lambert, to visit the place where the remains were interred after the general exhumation. We accordingly set out, ordering the carriage to follow us; and Madame Methouard quitted us, to go back to Les Granges, to prepare us a dinner against our return. 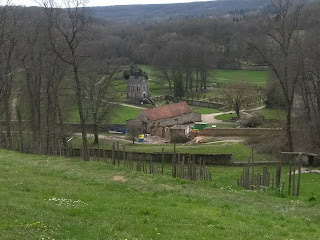 Pursuing the Chevreuse road, from its entrance into the valley of Port Royal, towards St. Lambert, we had, on our left, the hills which immediately rose from the deep hollow way, thickly wooded with forest trees. The Spanish chesnut,, beech, ash, and birch trees, were peculiarly picturesque, from their age and the variety and brightness of tints of their foliage. We saw, amongst the woods, numbers of squirrels, chasing each other round the trees, and leaping from bough to bough; and likewise partridges, rabbits, and hares; of which latter, we saw some about the ruins. To our right hand, was the grand enclosure wall of the monastery, flanked with its eight towers, built by the recluses during the period of the civil war. They must have been a perfect defence to the valley of Port Royal, as they completely command the defile of entrance…. I cannot describe the extreme beauty and luxuriance of the vegetation…. Our road now took another turn to the right; and quitting the hills, strikes across the wide and cultivated vale towards Chevreuse. The beauty of the bold sweep which the road makes in this place, is not to be described; and the gay coloured dresses of the country people and villagers, who are seen passing to and fro between the tall stems of the trees, have a very lively and pleasing effect. 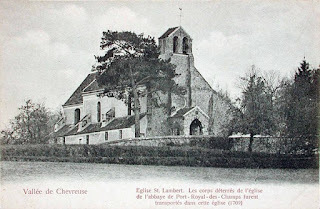 On the gradual slope of ascent, on the opposite side of the valley, a little to the left, out of the road to Chevreuse, stands the little church of St. Lambert, completely embosomed in trees. The church of St. Lambert is any thing but magnificent. It is one of the smallest I ever saw… . It is situated about half way up the wide, sloping-, and cultured hill; and I rather think the church-yard itself, but if not, the spot contiguous, commands a cheerful view of all the narrow valley of Port Royal, and of the river, or brook, for it is only about eighteen feet wide. The door being open, we entered the church, which is remarkable for nothing but its shabbiness. We found, however, by the high altar, another altar, which was taken from Port Royal at the time of its demolition. Its construction is rude, and the figures are in bad taste, and have been much mutilated during the times of terror. After searching for some time amongst the grass and nettles, with which the church-yard is over grown, we discovered the four stones which mark the wide pit or grave in which were interred the mangled remains of the saints of Port Royal…. I must here observe, that, remote as the little church of St. Lambert appears, we were by no means the first who visited it … Port Royal is still held in such veneration, that on the second of November (All Souls day) and on the twenty-ninth of October (the anniversary of its dispersion) there are multitudes of persons who have "la devotion" to visit this consecrated spot; and many of them make, what is termed, the pilgrimage of Port Royal. That is, they take a regular tour, divided into ten or twelve stations, of all the places most remarkable as the scenes of the lives, or deaths, or burial places of the Port Royalists; and at each they spend some time in prayer, meditation, or other devotional exercises. A book, indeed, is published, entitled, "Manuel du Pelerinage de Port Royal:" it was written by the Abbe GAZAGNES . The country people, whose parents benefited by the piety or charity of Port Royal, are particularly assiduous and devout in visiting its ruins, and the common grave of their benefactors at St. Lambert. We were told, that both in the October which completed the century of its destruction and on that of the remarkably hard winter two years ago, many aged people were seen kneeling, and some of them for hours, with their white locks exposed to a pouring rain, both amongst the ruins of Port Royal, and on the site of the interment, in the church of St. Lambert. Having completely satisfied our curiosity, we began to feel the fatigue of walking several hours; we therefore got into the carriage which had followed us, and went back to Les Granges, where Madame Methouard had prepared us a very comfortable dinner in M. le Maitre's room…. After dinner, Madame Mathouard gave use an excellent dessert of very fine fruit; the most valuable part of which, in our eyes, was a plate of pears from a tree planted by Arnauld d’Andilli, and some peaches planted by Pascal. Having finished our repast, we again went out into the farm-yard of Les Granges, to see the celebrated well dug in the mist of it under Pascal’s direction. This well is twenty-seven French toises in depth; and draws up the water from the level of the valley of Port-Royal below. The curiosity consisted in the machinery contrived by Pascal and executed under his direction, by which a child of ten years could with the greatest facility, immediately draw up a quantity of water equal to nine common buckets. 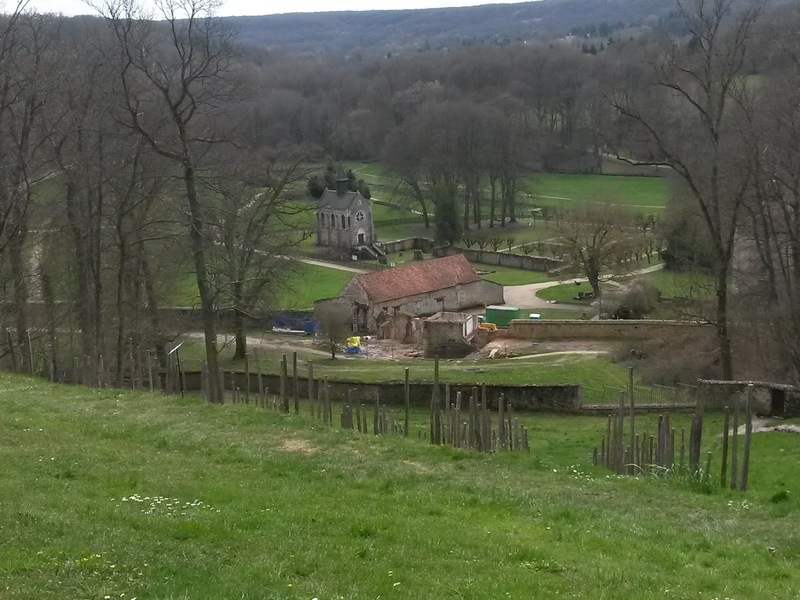 Pascal’s well stands exactly in the middle of the farmyard of Les Granges, just opposite the door of the house; but it is not discernible to those unacquainted with it, because it has been completely surrounded by piles of fire-wood, faggots and haystacks…. 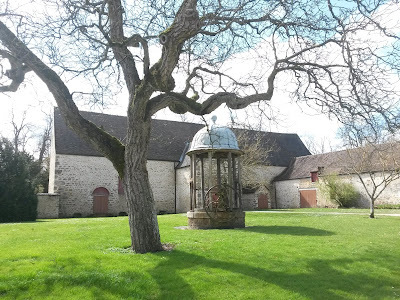 On one side of the farmyard remains a sor of dismantled hovel, or seed-house, the remains of a cell which Pascal used as a study, and where he was continually accustomed to retire during his visits at Port-Royal, when he wished to be in perfect and uninterrupted solitude. We then visited the garden behind the house, which was formerly that of the recluses. It is very spacious, and surrounded by a high wall, and planted with abundance of fruit trees. From space to space are managed little green arbors, which served as places of retirement and meditation to the recluses during their work….. Among the fruit trees we saw several of a great age, completely covered with moss and lichen, and of which only a very few branches still bore any fruit. These were planted by the hands of Arnauld d’Andilli. Three of them only still bore fruit; but the others ,though completely withered. Are left untouched, and fenced round, out of respect to the memory of the saints of Port Royal. “They are holy trees,” said Madame Methouard. From the garden, we visited what was formerly the orchard of the recluses, whence we took one farewell view of the ruins of Port Royal. 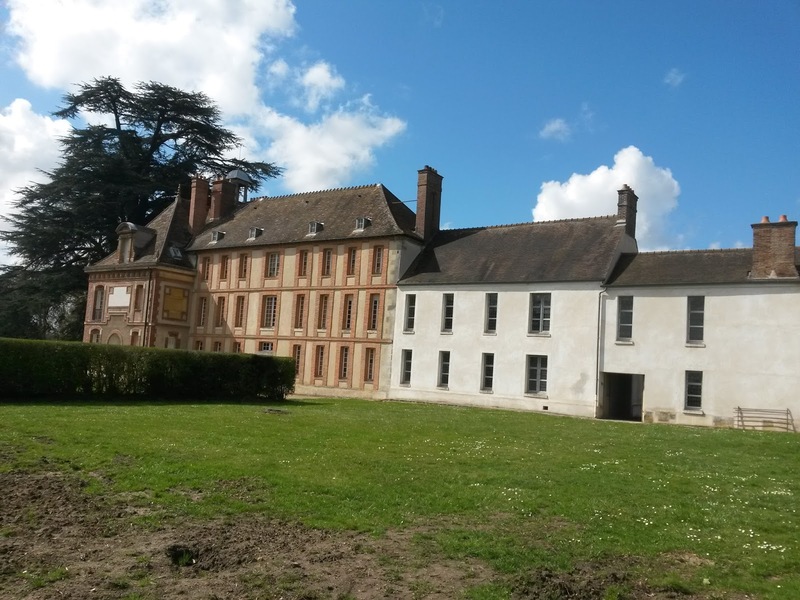 Scarcely an hour after quitting the demolitions of Port Royal, we again passed on our way back to Paris, the palace of Versailles, now desolated like it, where the decree for that demolition was signed …. "Account of a Visit to the Ruins of Port-Royal des Champs, being an Extract from my Journal to the Continent of the 18th of September 1814"